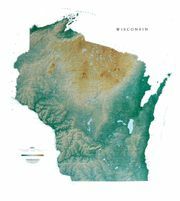 Beautiful wall map of Wisconsin with subtle color gradations indicate elevation variations. Also shown are roads, towns, lakes, rivers, and mountain ranges. The Wisconsin Raven map is available in paper or laminated and comes rolled up for a nice wall display!